With dreary, cold days and a long winter, having indoor fitness options is ESSENTIAL!! Though I always leave the room when my kids choose this type of fitness, I thought I would share to see if anyone else had this particular video. 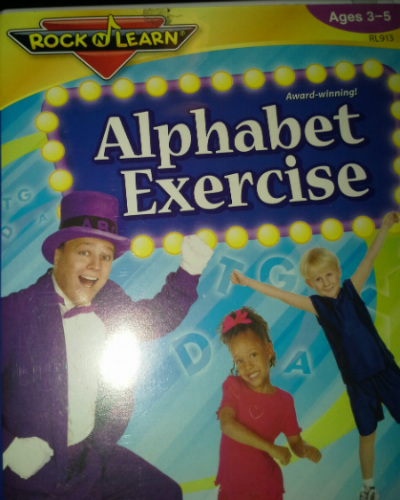 It’s called Rock N’ Learn: Alphabet Exercise. It’s an educational video that surprisingly my kids actually enjoy and actively do. Though you can’t readily detect it from my picture, the main Rock ‘N Learn leader in the purple suite is QUITE creepy looking in the video. His suit is the same color of Grimace – the big, purple triangular shaped Mc Donald’s character, and his slightly bulging eyes and voice set to 80’s style beats are just kind of weird. But I digress (and I’m just a bit older than the recommended ages)… the point of this video is for my kids to get some exercise, and if they learn a bit at the same time, it’s a bonus! 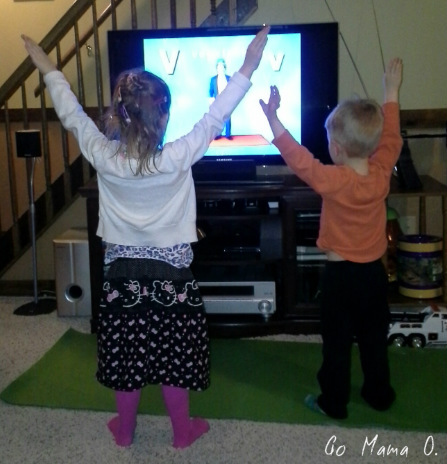 Here they are rockin’ and learnin’ to the letter V.
“Make a V” – my kids show how it’s done! They even ask to get out my yoga mat for their exercise. My attempts to do yoga with them are MUCH shorter lived than this whole video, but still fun. At any rate, it’s about 45 minutes of exercise and quite time for me, so I don’t have too many complaints about Rock ‘N Learn. Let me know if there are other educational fitness videos that you would recommend! How do you keep your kids active when the weather isn’t cooperating? Happy Spring – looking forward to those May flowers! This entry was posted in Kids, parenting and tagged exercise, Family, fitness, indoor activities for kids, indoor fun, kids by Cathy O. Bookmark the permalink.